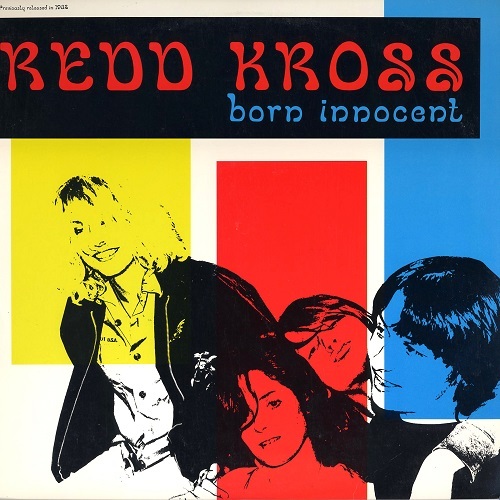 Redd Kross - Born Innocent ! Born Innocent is the debut album originally released by Red Cross (before they had to rename to Redd Kross) in 1982 on Smoke 7 Records, and re-released in 1986 on Frontier Records with different artwork and in 1991 with three bonus tracks taken from Sudden Death and American Youth Report compilations. 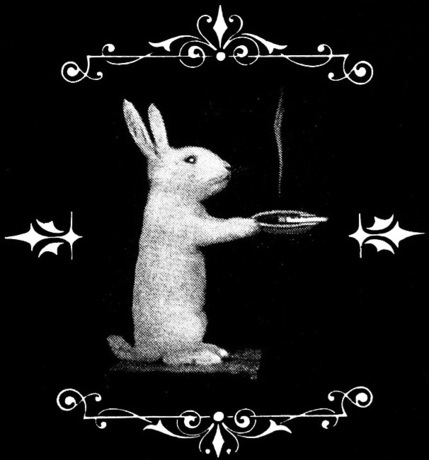 This record was produced by Smoke 7 owner, Felix Alanis, who was also the lead singer of RF7. 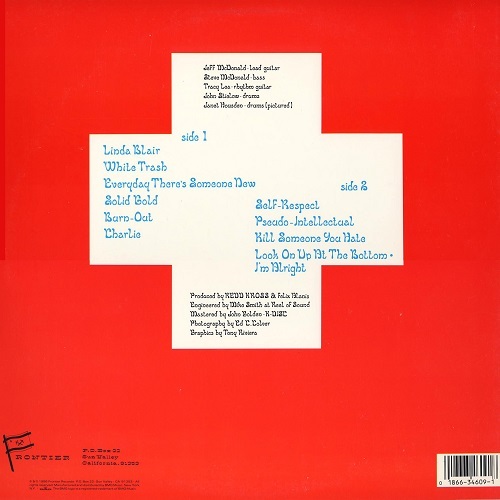 At the time of their first self-titled EP, in 1980, the band changed their name to Red Cross, which was allegedly inspired by the masturbation scene in the film, "The Exorcist." Eventually, Greg Hetson left to join the Circle Jerks and later, Bad Religion and Reyes left for Black Flag. Keller left to join Trixie and the Doorknobs as its guitarist and singer. To complete the lineup on their first full-length album, Born Innocent, they assembled a revolving door of musicians including a young John Stielow on the drums. Full of the brothers' pop culture obsessions, Born Innocent featured odes to Linda Blair (who starred in a television movie of the same name), a cover of "Look on Up from the Bottom" by the Carrie Nations from Beyond the Valley of the Dolls, and Charles Manson (whose song Cease to Exist they covered). The album also contains nod to Lita Ford. 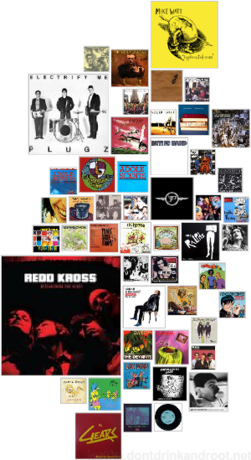 Not long after the release of the album, the group was threatened with a lawsuit from the International Red Cross and changed their name to Redd Kross, allegedly being inspired by Redd Foxx. In 1984, lead guitarist Robert Hecker joined the band, as Redd Kross embarked on tour in support of Teen Babes from Monsanto. In that same year, they were featured on the soundtrack of Desperate Teenage Lovedolls with their cover of the Brady Bunch Kids' "It's a Sunshine Day". Jeff and Steve appear in the movie, and its sequel Lovedolls Superstar and as well co-wrote it with Dave Markey and Jennifer Schwartz. Both movies are available now on DVD. And here on dis very bloug, Desperate Teenage Lovedolls and Lovedolls Superstar. Vinyl ripped with dMC Auxiliary Input straight to Wave, each track edited with EAC then 224kbs Mp3 encoded using db powerAMP (what else?)... tags & scans included as usual, now let's rock and play innocent! j’apprends 2 choses ,que felix alanis produit l'album ,pourtant j'ai l'album original mais peut etre a l'epoque j'avais pas fait attention ou je ne connaissais pas encore RF7(groupe que j'adore)et que chavo reyes jouait dans l'album ,mais il faisait quoi ? Ron Reyes était à la batterie pour les jeunes Red Cross avant de remplacer Keith Morris au chant dans Black Flag.